Detailing the physical features, habits, territorial reach and other identifying qualities of the Canadian Tiger Swallowtail. A classic northern native, the big and bold Canadian Tiger Swallowtail is found coast to coast in the northern part of the continent. 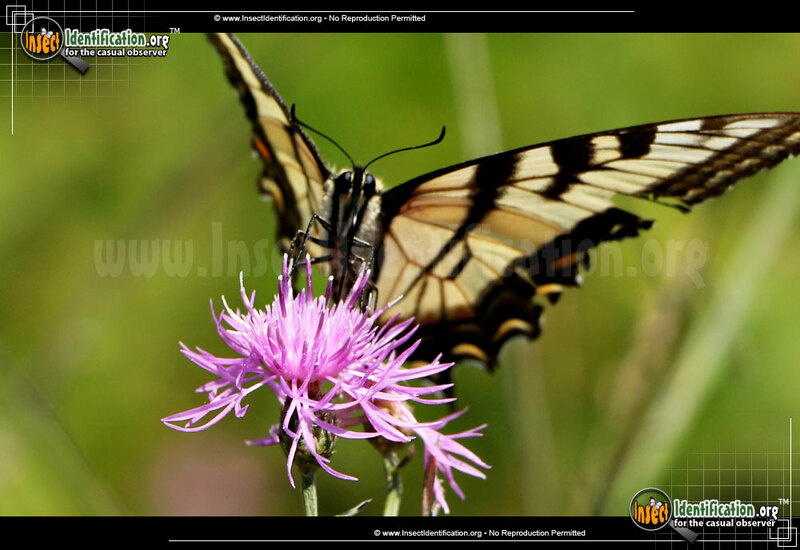 Commonly seen in northern U.S. states and all provinces, the Canadian Tiger Swallowtail is similar in appearance to the Eastern Tiger Swallowtail. 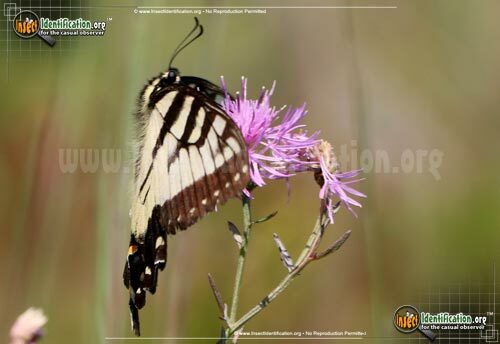 In some parts of its range, the Canadian Tiger Swallowtail has been replaced by the expanding Eastern Tiger Swallowtail. The two species were once considered the same, but genetic testing done in the early 1990's merited a separation of the two types. The Western Tiger Swallowtail is taking over territory in British Columbia. As its feline name suggests, Canadian Tiger Swallowtails are yellow with black stripes. Long black 'tails' extend from the bottoms of both hindwings. An orange crescent sits close to the inner edges of each hindwing. When the wings are flat, the hindwings come together and form a single orange eyespot. Hindwings are also shaded with blue in the bottom border. The underside of the wings have more orange and blue along the borders. Males can be found congregating in large numbers at puddles (a social activity called puddling). Water and minerals dissolved in puddles are ingested at these gatherings. Females do not partake in the event. Females lay eggs on the southern leaves of trees for more sun exposure. Young caterpillars are white and brown like bird droppings, making them less likely to be eaten. Older caterpillars are green and eventually become brown, blending in with leaf cover. They have enlarged heads that have two false eyes and a yellow 'collar'. An ostromerium gland behind its head secretes a foul odor when it is disturbed. They feed on a variety of leaves like those from birch, black cherry, and aspen trees. They are not a pest, however, so they do not require control. Larvae pupate through the winter and emerge as winged adults in the following spring. Adults are active from late spring into mid-summer when they can be seen visiting flowers for nectar. Look for them in open deciduous forests where host trees live. They are also at home in more developed environments like backyards, gardens and parks in urban areas.